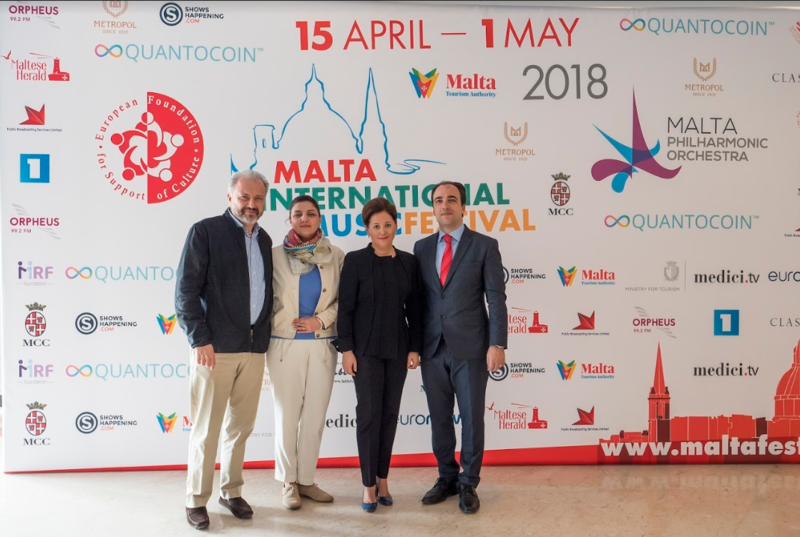 Wednesday, the fourth day of the Malta International Music Festival, currently being organised by the European Foundation for the Support of Culture, also saw the launch of Armenia Cultural Days which are taking place between the 18th and the 30th April. These include 10 concerts by Armenian and Maltese performers of music composed by Armenian and Maltese composer, one dance performance, four exhibitions and the screening of two films. Most events are being held at the Mediterranean Conference Centre. The press conference started with a short video presentation on the landscape, history, culture and hospitality of Armenia. Alan Chircop, artistic director of the Foundation for the Support of Culture, then introduced the concerts that also form part of the programme of the Festival. He said that this evening’s concert when the Malta Philharmonic Orchestra is being conducted by Armenian conductor Sergey Smbatyan with the participation of the virtuoso violinist Aiman Mussakhajayeva from Kazakhstan was a very important event for the organisers because it highlighted the collaboration between Malta and Armenia. He then gave a brief overview of the events that fall within the Armenian Cultural Days in Malta. He said that the Foundation felt honoured to be collaborating with Armenia and reminded those present that the resident orchestra of the Festival is Armenian. Her excellency Victoria Bagdassarian, Ambassador of Armenia to Italy and to Malta expressed her pleasure at participating in the press conference and being present to a concert celebrating the 115th anniversary of Aram Khachaturian, Armenia’s legendary composer. She remarked that this event co-incided with the 25th anniversary of the establishment of diplomatic relations between Malta and Armenia. The presence of Armenians in Malta dates back to the 14th century when following the fall of the Armenian kingdom of Cilicia, Armenian knights settled in Malta. Great changes in the lives of the two countries and their people took place over the years, but the mutual cordiality and sincerity of the two peoples, and their simple human sympathy remained unchanged. Considerable progress was made in the development of cultural relations between the two countries. She thanked all the organisers and participants of the Armenian Cultural Days in Malta and augured that this event will bring the two people closer to each other as well as open a new page in Armenian-Maltese relations. Lusine Karamyan, head of cultural relations within the Ministry of Foreign Affairs in Armenia, read a message from the Minister of Culture in Armenia. She commented on the remarkable elegance of Armenian culture and on her pleasure in participating in Armenian culture week, a witness of the collaboration between the two countries. She particularly thanked the Ministers of Justice, Arts and Culture in Malta, Dr Owen Bonnici, and the Minister of Culture of the Republic of Armenia, Armen Amiryan. Jason Micallef, Chairman of the Valletta 2018 Foundation, gave special thanks to Konstantin Ishkhanov, President of the European Foundation for Support of Culture, for organising the event and said that he felt confident that as a result of this the relations between the two countries will get stronger. He said that he was deeply honoured to have the V18 Foundation endorsing such an important music festival that enhances the strong international dimension of the overall programme of the V18 Foundation one of whose main aims is to give opportunities to local talent to integrate with foreign talent. He said that when he was in Moscow he was struck by the interest of the media in the festival and in Valletta as culture capital for the year. He said that when the Chairman of the Malta Philharmonic Orchestra approached him with the idea of endorsing the project he had immediately seen its possibilities with a long-term rippling effect. Sigmund Mifsud, Chairman of the Malta Philharmonic Orchestra said that he had visited Armenia only a short while ago and had been impressed by the culture of the country. He strongly believes that through such collaborations one learns a lot especially in the music field. He was looking forward to tonight’s concert when an Armenian conductor would be conducting the MPO and augured that this was only the first event in a series of other events. Kenneth Spiteri, Chairman of the Mediterranean Conference Centre, emphasised the historical importance of the building and expressed his pleasure at collaborating once again with the Foundation. He thanked the Foundation for organising the event and invited all present to go round the building when they attended the events laid out during the week. A short video presentation showing violinist Aiman Mussakhajayeva in concert followed. Ms Mussakhajayeva was on her second visit to Malta. She recounted how as a young girl she had met Khachaturian who had foretold that she would have a successful career but insisted on the importance of patience and hard work for success. Nikolay Kostandjan and Anna Ter-Hovakimyan, Director of the Komitas Museum Institute and Director of the State Orchestra of Armenia respectively, both expressed their pleasure at being in Malta to present their country to the Maltese and to show its culture and its heritage. Asked how the idea of Armenian days was born Konstantin Ishkhanov said that the seeds were sown during the discussions he had to invite the State Orchestra of Armenia for the Festival. A member of the Armenian Orchestra, Sargis Balbabyan, speaking on behalf of his colleagues, said that the orchestra of which he was a member worked very well with the Malta Philharmonic Orchestra and looked forward to joint future projects. They felt that such collaborations were very important for musicians to make friends and enrich their musicianship. It was the second time that the Armenian orchestra had come to Malta. They had enjoyed the opening concert and looked forward to the joint concert. Famous opera singer Lyuba Kazarnovskaya shared with the audience her experience of been and working in Armenia many times and her deep impressions about Armenian music and musicians. A number of speakers from the floor expressed their admiration for Armenian culture, the importance of cultural diplomacy, and their pleasure in participating in the event and especially in having the opportunity of presenting Armenian culture outside their country. At the end of the conference Alan Chircop thanked the partners of the Foundation – the Malta Philharmonic Orchestra, the Mediterranean Conference Centre, the Valletta 2018 Foundation – for their collaboration as well as the Ministers of Tourism and Minister of Culture and the media.